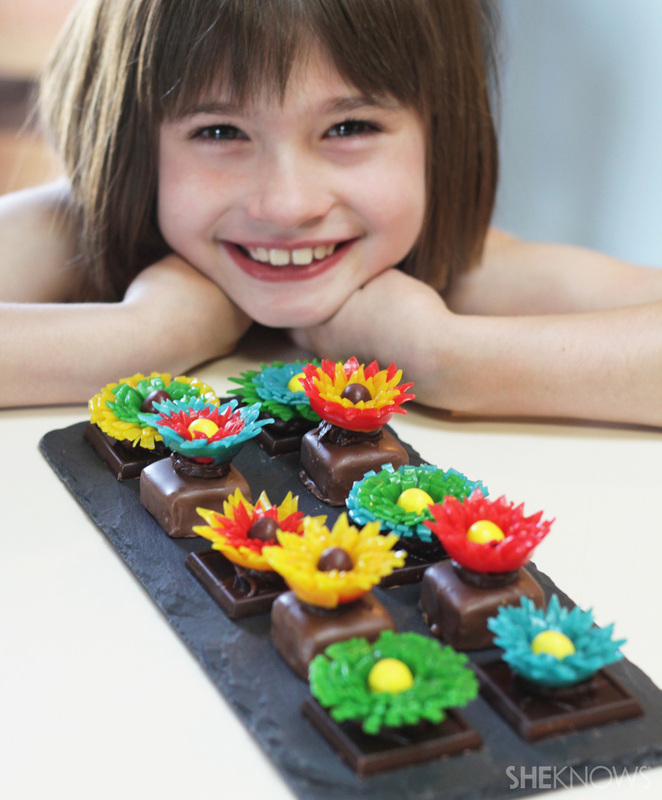 Creative chefs of any age will love this edible art idea. 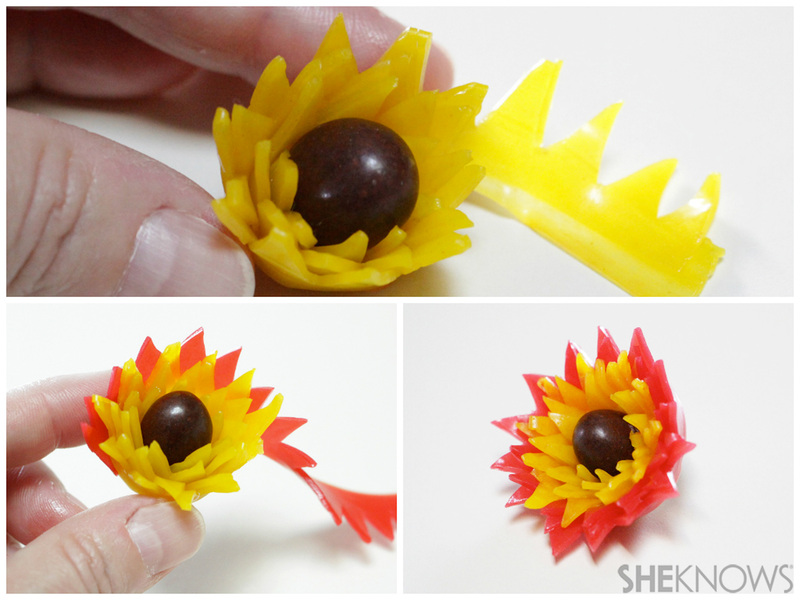 These Fruit Roll-Ups flowers are the perfect combination of kid food and crafty fun. 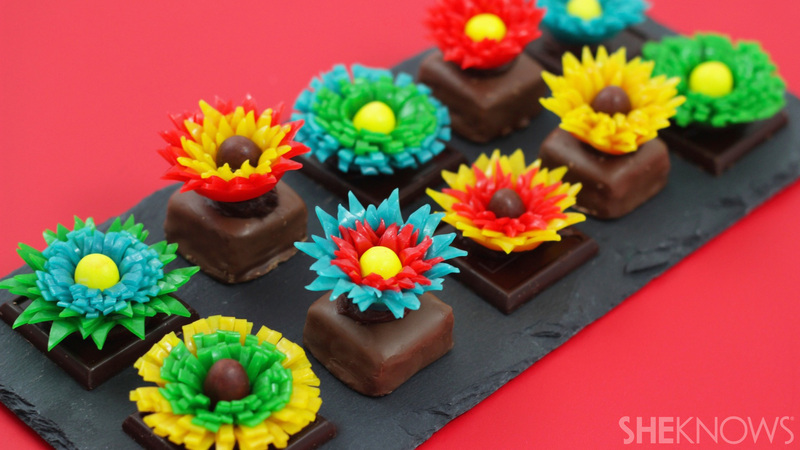 These flowers can be made with any assortment of Fruit Roll-Ups flavors and colors. 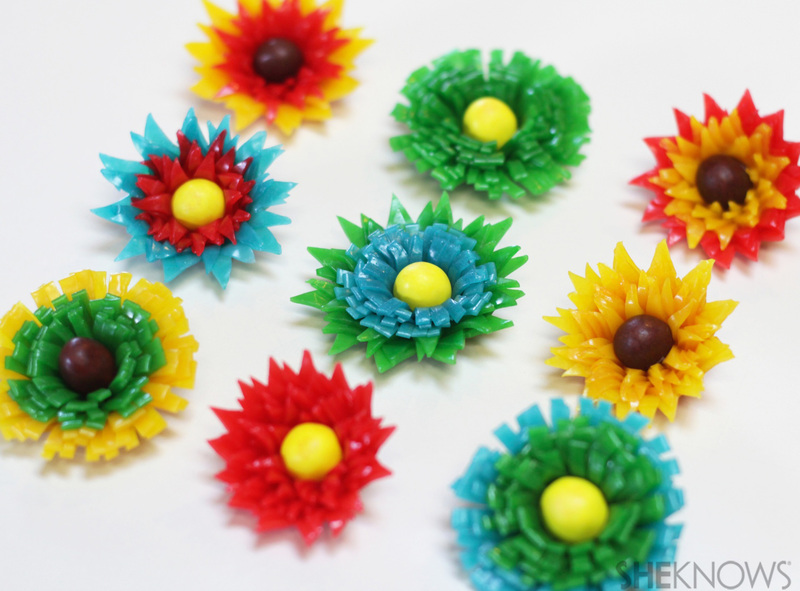 Eat them one by one, or make a big, beautiful bouquet, and use them as colorful dessert toppers on cupcakes, brownies, cakes and chocolate squares. If you have a peanut allergy, then you can always substitute the peanut M&M's for jelly beans, gumdrops or sour balls. 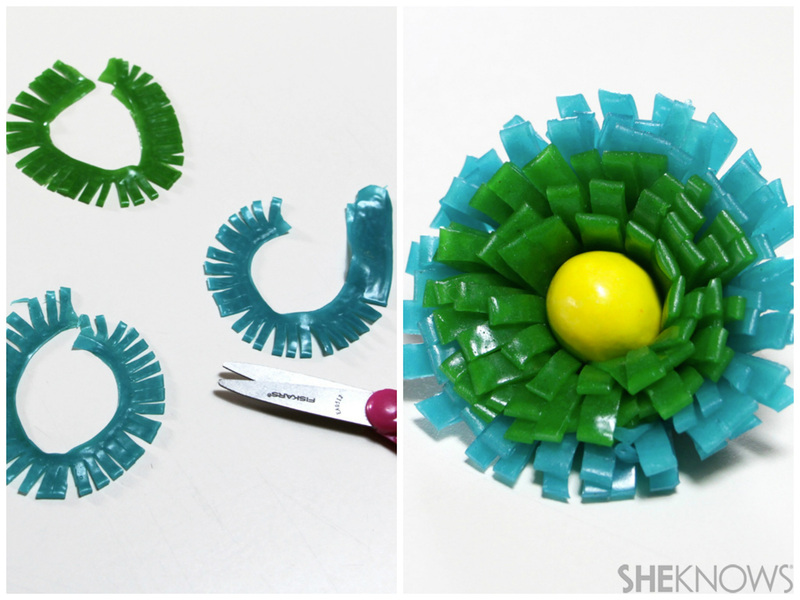 Each Fruit Roll-Ups strip will make 1 flower. The triangle shapes can vary in size and thickness. Experiment with different angles too. As you roll your strips around the M&M's, they can be sticky and may want to lie flat to the M&M's. 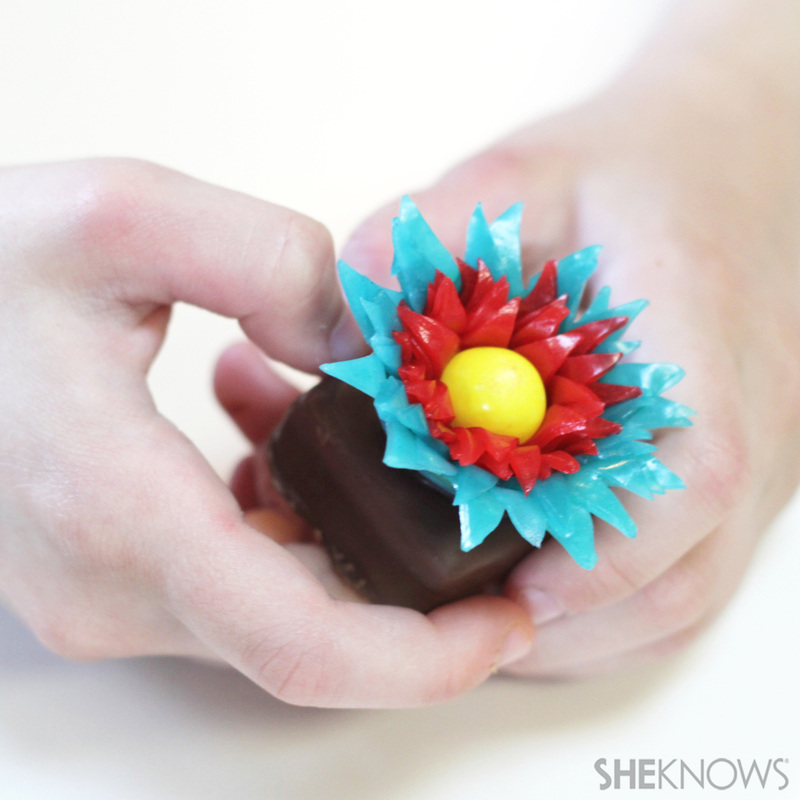 Don't worry, you can press the petals out as you go and flatten them when you're done. To add a little depth, attach each consecutive strip slightly higher than the previous strip so that the rows of petals can fan out and be seen better. For an alternate petal design, make straight cuts in the Fruit Roll-Ups strips. They don't have to be perfect. Play around with varied cuts. If you want to keep and use the flowers later, then they can be stored in a parchment paper-lined container in the refrigerator. 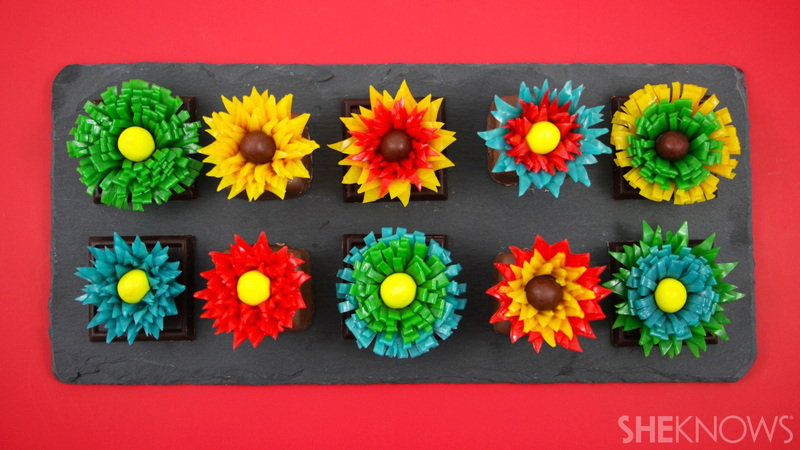 Use your edible flowers on brownies or chocolates by attaching them with a dab of frosting. You can mix and match your colors, flavors and petal designs. Have fun being creative and crafty in your kitchen. And before you eat them, display your array as a gorgeous edible centerpiece. Gather your ingredients. 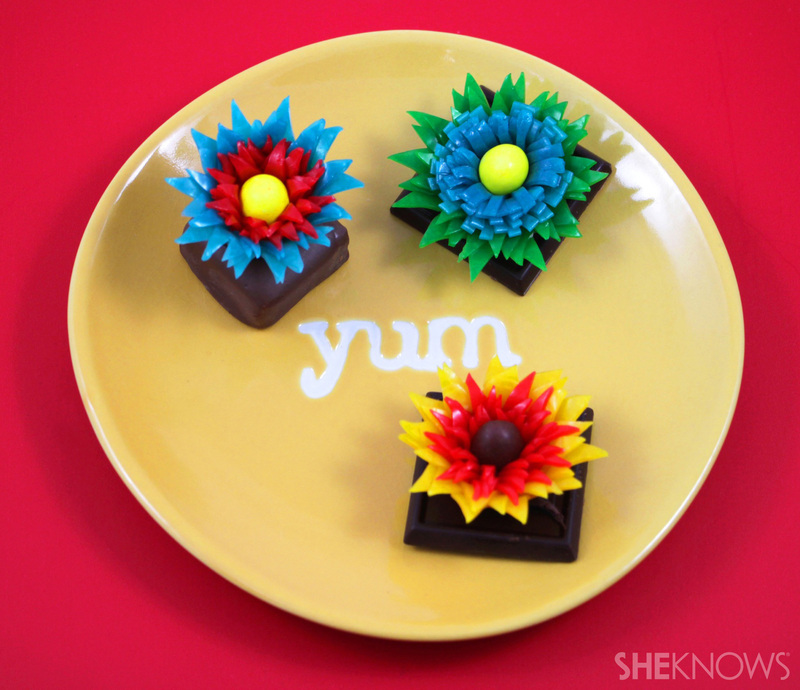 For these flowers, I used red/yellow and blue/green Fruit Roll-Ups for the petals, and brown and yellow peanut M&M's for the centers. You can use whatever flavors or colors you like. 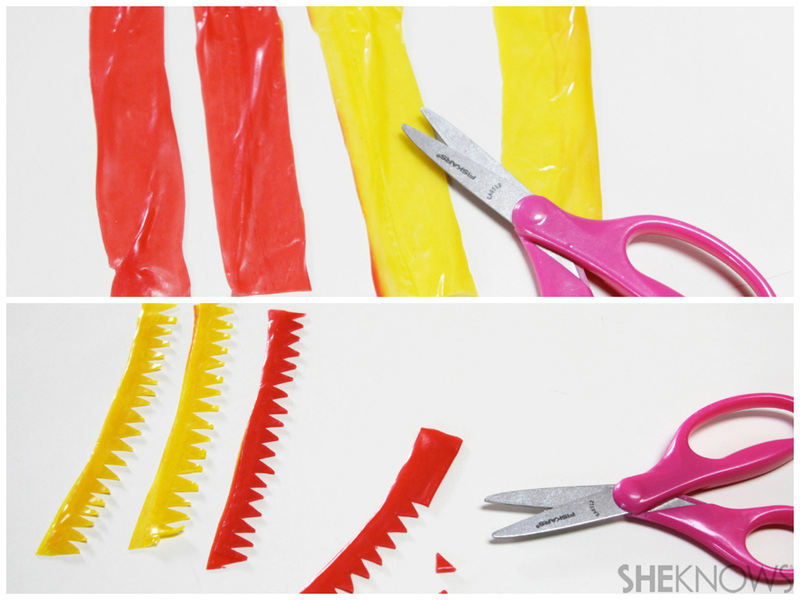 Using a clean pair of scissors, cut the Fruit Roll-Ups into 4 equal strips approximately 1 inch wide. Fold each strip over to make them a little thicker and easier to cut. Then cut triangle shapes into each strip. Roll the first cut strip around a peanut M&M's. Continue adding and overlapping each strip, starting where the other stops, until all 4 are attached. Once all 4 strips are attached, gently press the petals out to flatten and open the flower. 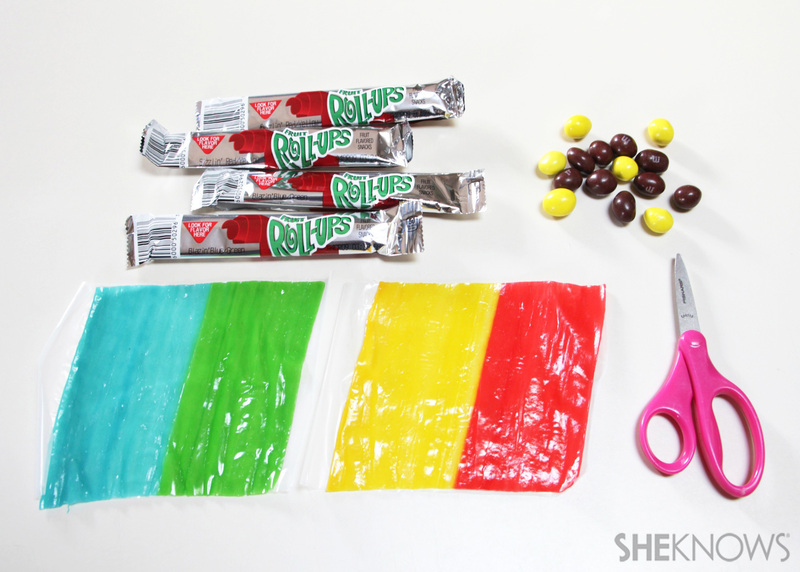 For an alternate petal shape, make straight cuts in each Fruit Roll-Ups strip with scissors, and attach them to the peanut M&M's in the same way as steps 4 and 5. Gently flatten and open the petals for the desired look. 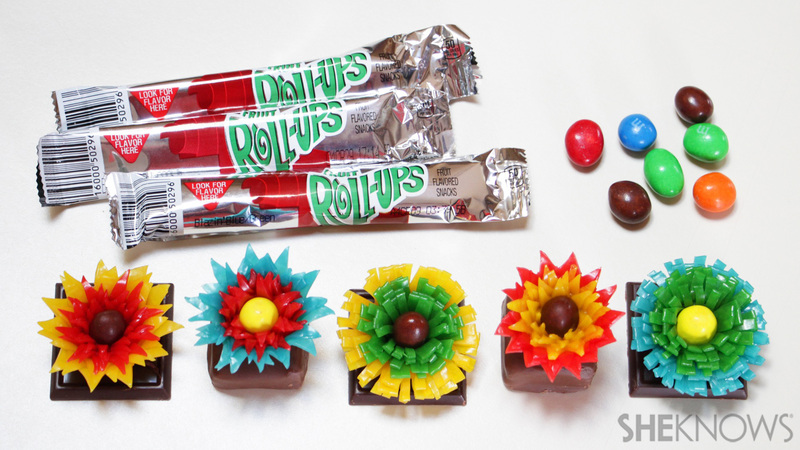 If desired, use the Fruit Roll-Ups flowers for decorative toppers on all kinds of desserts. An easy, no-bake option is to attach them to chocolate candy bars, like Snickers Peanut Butter Squares or Ghirardelli Squares, with just a little dab of frosting.